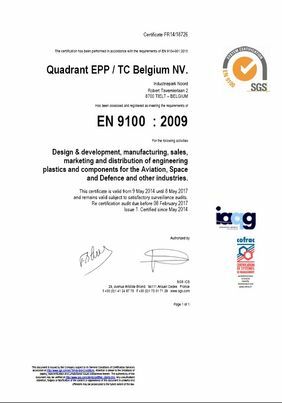 Vreden, Germany – June 4, 2014 - Quadrant Engineering Plastic Products (EPP), the global leader of machinable plastics, announces the successful completion of AS9100C certification for its Belgium and UK locations serving the global aerospace industry. This significant achievement makes Quadrant the first manufacturer to offer AS9100C compliant engineering plastic stock shapes, further strengthening its long-term support for customers in this sector. AS9100C is the recent update to the widely-adopted and standardized quality management system for the aerospace industry – EN 9100. The international standard specifies the requirements for a quality management system of organizations that design, develop, produce, market or distribute products for the aerospace industry. Certification of Quadrant’s site and Technical Center in Tielt, Belgium, and its UK Todmorden location is the latest milestone in Quadrant’s commitment to meet the sector’s increasing need for reliable quality management from its global supply chain. Quadrant develops and supplies stock shapes and machined parts from the qualified facilities. Its AS9100C registration includes design & development, manufacturing, machining, warehousing, sales, marketing and distribution of engineering plastics and components for aviation, space and defense applications. Quadrant offers the largest portfolio of engineered and high performance thermoplastics for the aerospace industry. Well recognized materials like Duratron®, Fluorosint®, Ketron® or Techtron® are the base for applications such as handles, grommets, brackets, fasteners, seals, connectors and wear parts used in hydraulics, engines and nacelles, air frame and wings, and within aircraft interiors. These products address requirements such as flame retardancy and performance under extreme temperatures, light weight, high strength to withstand shock loads, and chemical resistance. Quadrant has been supplying engineering plastic solutions to the aerospace industry since 1965. Technical and development teams work together with customers to find the best solution to particular functionality and processing challenges, for example, developing a one-part complete solution to replace multiple parts and reduce complexity. This commitment reflects Quadrant’s dedicated way of working for key market segments and its strategy to offer high-quality products and support to its customers. In addition to AS9100C compliance, the company’s quality standards include ISO 9001 certification, the highly-regarded ISO 13485 accreditation for the machining and sales of plastics parts and medical components, and NORSOK M-710 compliance for PEEK stock shapes. Quadrant will be showcasing its comprehensive products and solutions for the aerospace industry at the Farnborough International Airshow, July 14 – 20, 2014, Booth Hall 4/G1.